The late-season storm making its way through the D.C. region has brought snow and sleet to the area, delaying starts for federal agencies for Tuesday, closing major school systems and causing some power outages. Check out everything you need to know — from closings and delays to updated road conditions. WASHINGTON — The late-season storm making its way through the D.C. region is bringing plenty of snow and sleet to the area, delaying starts for federal agencies for Tuesday, closing major school systems and causing some power outages. D.C. sees its first winter’s storm … in March. See the view from around the region. Most major public school systems, except D.C. and Calvert County, are closed today. D.C. and Calvert County are operating under a two-hour delay. St. Mary’s County schools are open without delay. D.C. students who are absent today because of the weather will be excused. The Office of Personnel Management, which determines if federal agencies will close, announced a three-hour delay Tuesday with an option for unscheduled leave or unscheduled telework. Amtrak has suspended all service between New York and Boston due to storm conditions. Acela Express and Northeast Regional services that operate between New York City and D.C. will run on a modified schedule, with some trains truncated or canceled, including some trains that operate in Virginia. Transportation officials in Virginia and Maryland are urging people to stay off the roads if they don’t have to go anywhere right away. VDOT says many secondary roads and neighborhood streets are covered with snow. Charlie Gischler, with the Maryland State Highway Administration, tells WTOP they’d like people to stay home and not hit the road until at least 10 a.m.
With fewer people on the roads, work crews can do more to clear them. Gischler also says they’ll be taking advantage of the high sun angle throughout the morning in their efforts to salt the roads. As always, the WTOP Traffic liveblog has the latest on crashes and road conditions. If you’re planning on public transit, Metrobus is operating on a moderate snow plan. In addition, thousands are without power in the D.C. area. The nor’easter forced airlines to cancel more than 5,000 flights nationwide. The storm has led to state-of-emergency declarations in Maryland and Virginia. A number of trees have been downed in Calvert, Charles and Anne Arundel counties. The WTOP listening area is on a winter weather advisory until 2 p.m. The slushy, wintry mess will change to mainly snow. There will be little to no additional accumulation for most areas. One to 3 inches are expected in the D.C. metro area. Gusty winds may re-freeze wet conditions tonight and it will be blustery and cold Wednesday. Get the full forecast on the WTOP.com weather page. Road conditions in the region are treacherous. WTOP’s Nick Iannelli reports that, despite the limited amount of snow that fell overnight in the District, it’s a different story farther north, especially on I-270. In Gaithersburg, there is a layer of snow coating I-270 and many drivers will find themselves heading through the tracks of the car in front of them. Outside your vehicles, it gets worse. Nick Iannelli’s car actually got stuck in one of the many piles of snow left by plows on South Frederick Avenue on Route 355. Visit the WTOP Traffic liveblog for the latest. D.C. Mayor Muriel Bowser declared a snow emergency. Vehicles not removed from emergency routes will be ticketed and towed. D.C. streets were pre-treated for the winter weather, Mayor Muriel Bowser said Monday. More than 200 snowplows were deployed Monday evening. Fire department vehicles have been fitted with snow chains. In Virginia, Gov. Terry McAuliffe declared a state of emergency Monday, allowing state agencies to assist local governments with responding to the severe weather. Northern Virginia is expected to bear the storm’s brunt. “We’re on top of it. We’ve already pre-treated and we’re ready to go,” he said. McAuliffe told WTOP that road-treatment preparations began Sunday, with 7,800 pieces of equipment and 8,600 personnel hitting the streets. Still, state officials urged Virginia residents to stay off the roads unless travel is absolutely necessary. In Maryland, Gov. Larry Hogan declared a state of emergency Monday in anticipation of the snowstorm. Frederick and areas northeast toward the Pennsylvania state line are expected to be hit hardest. “We urge all Marylanders to use common sense and to stay indoors and off the roads,” Hogan said. Maryland State Police have also implemented the snow emergency plans in several counties to enable immediate removal of abandoned vehicles from state roads and highways. As part of Montgomery County’s snow emergency, parking is restricted along any snow emergency route. Parking at county-owned parking garages will be free through midnight Tuesday. See more information on the county’s site. Montgomery County officials advise residents to visit its snow emergency page for snow removal information and for requesting snow-removal service. Rockville, Maryland, has also declared a snow emergency. Cars need to be off city roads and neighborhood streets. A snow emergency plan is also in effect in Frederick, Maryland. All vehicles need to be moved from snow emergency routes or risk being towed. Here’s the full list of snow routes. 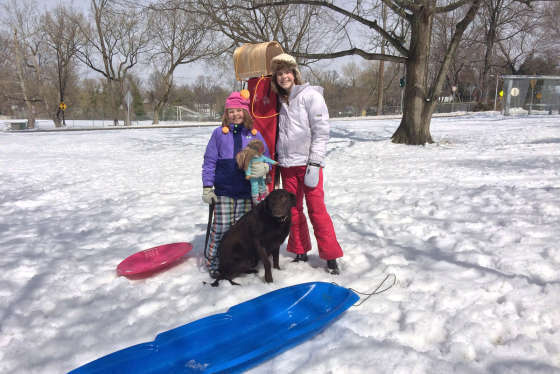 Falls Church, Virginia, has also activated a snow emergency plan. Click here for a full list of snow routes. Get the latest traffic updates on the WTOP traffic page, by following @WTOPTraffic on Twitter and by listening to 103.5 FM on-air or online. Metro is single-tracking on the Red Line between Wheaton and Forest Glen. Montgomery County Fire says they’re looking into a report involving what could be an arcing insulator near the Wheaton station. That’s a problem that’s occurred repeatedly on Metro rail lines. Metro workers and firefighters are investigating. Metrorail: Metro will close as usual at 12 a.m., Metrorail trains run on a Saturday schedule. All stations remain open. Metrobus: Operating on a moderate snow plan, with some service suspension and detours. Click here for a complete list of bus service. ART: All STAR trips before 10 a.m. excluding Dialysis are canceled. Service on ART 41, 51, 55, 77, 87, 87A and 87P (no 87X) will be provided with delays. MetroAccess: Metro’s paratransit service has been suspended all day Tuesday. Metro announced service would resume Wednesday. DASH: Operating on a 2-hour delay. Extended morning service on the AT3, AT4, and SafeTrack shuttles until 10 a.m., with snow detour routes on multiple lines. VRE: VRE plans to run on an “S” schedule. Fairfax Connector: Many routes operating on a Saturday schedule. No supplemental SafeTrack express service from Saratoga Park-and-Ride to the Pentagon. Loudoun County Commuter Bus Service and Metro-Connect: No Commuter bus services to Rosslyn, the Pentagon, Crystal City, the Navy Yard, Washington D.C. and all Metro stations. MARC: MARC service running on an R schedule, meaning only trains with an R under the train number will operate. MCDOT: Ride On bus service on an “S Service Plan,” operating all its weekday routes, except Route 94, with limited service and delays. PRTC: OmniRide commuter buses operating only to the Franconia-Springfield or Tysons Corner Metrorail stations, with delays. Metro Direct buses run on a weekday schedule with delays. Howard County RTA: Running on a 4-hour delay. MTA: There will be no commuter bus service today. Amtrak: Amtrak operating a modified schedule. There will be limited Acela Express service between New York City and D.C. The Northeast Regional service running on a modified schedule with some trains canceled. Service between New York and Boston has been suspended due to the storm. Area airports are warning customers about the flight delays. Airlines are estimating hundreds of flight delays and cancellations through Tuesday. As always, check with your airline about the status of your flights. The National Zoo was also closed due to the storm. The wintry mix left thousands of utility customers without power. More than 20,000 were without electricity as of 7 a.m. The largest outages were in Anne Arundel, where BGE reported close to 4,300 customers without power. Pepco reported that nearly 1,600 customers were without power in Prince George’s County and about 250 outages in D.C.
Dominion Virginia Power had about 2,500 customers without power in the King George area and 44-hundred without power in Stafford County. SMECO reported more than 6,500 customers without power in Charles County and another 1,400 in St. Mary’s County. Every home should have an emergency kit on hand in case of storms and power outages. Think extra food, medication, flashlight, batteries and other essentials. Check out other tips for stocking your emergency kit.